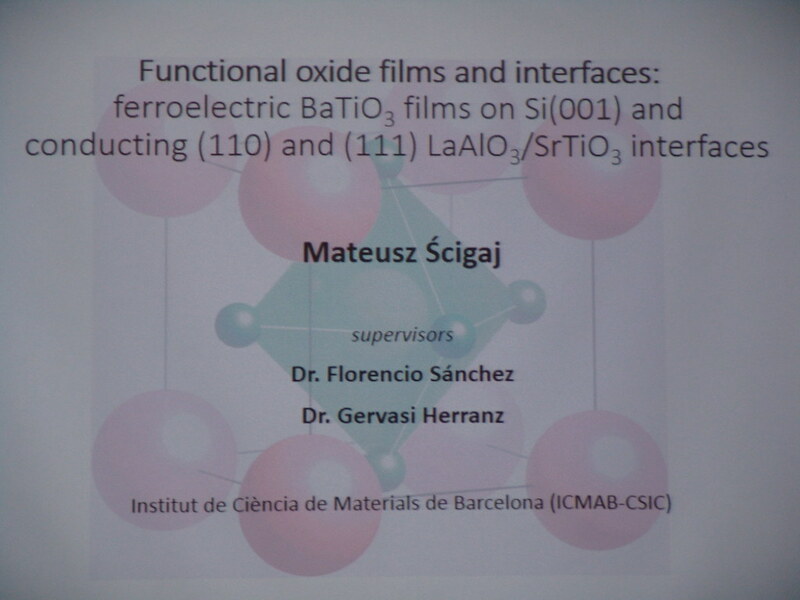 In this thesis the focus was aimed to the monolithic integration of functional oxides on silicon and to the exploration of interfaces between different oxides and the SrTiO3(110) and SrTiO3 (111) surfaces. Herein we report the monolithic integration of ferroelectric BaTiO3 on silicon, the current platform for microelectronics. This was done using the LNO/CeO2/YSZ buffer layer. The structural and functional properties are investigated. The films are epitaxial an c-oriented. Very low surface roughness and high ferroelectric remanent polarization are reported. High crystal quality ferrimagnetic CoFe2O4 was subsequently integrated in the structure. Thus obtained multifunctional structure shows high structural quality, robust ferromagnetism and superior ferroelectric properties, all at room temperature. Moreover, we report the integration of epitaxial BaTiO3 on Si using SrTiO3 buffer layer. Also in this case the recorded ferroelectric loops point to the good functional properties of this structure. A structural and functional comparison is given between BTO grown on the thin SrTiO3 and CeO2/YSZ buffer layers on silicon. We also report on the structural and transport properties of LaAlO3/SrTiO3 interfaces, with special emphasis on the LaAlO3/SrTiO3(110) interface featuring two-dimensional electron gas (2DEG). Further analysis of the interface structure and chemistry, electronic orbital hierarchy and superconductivity enriched our knowledge of the 2DEG electronic properties. Special focus also was given to the conductive interfaces comprising SrTiO3(110) and amorphous oxides. This study enables us to disentangle the relative importance of the oxygen affinity of the deposited metals and the orientation-dependent energy of vacancy formation and diffusion on the creation of oxygen vacancies. In addition we report the layer by layer growth of Y:ZrO2 on SrTiO3(110), leading to the epitaxial relationship YSZ(001) //SrTiO3(110). This novel idea of an interface featuring a symmetry discontinuity with the substrate being the lower symmetry material paves the way towards development of other innovative oxide interfaces.